As the world’s supply of fossil fuels diminishes, investing in and researching ways to efficiently implement sustainable energy sources is becoming increasingly critical. Solar energy, which utilises the powerful energy emitted from the sun’s rays, is an evolving technology. We are discovering better ways to harness the abundant light energy into a usable power source. In a recent discovery, a new type of solar cell has been developed. Most of the solar cells in use at the moment are made of silicon, which is effective at absorbing light energy (to be converted into electricity). However, the downside to this material is that it is expensive to manufacture. The effort to find an alternative solar cell material that is less costly to produce is an important area of research, so the news of these latest advancements is promising of a bright future. Scientists have been working on ways to produce an efficient and low-priced unit using perovskite structured compounds in place of silicon for almost a decade. Perovskite structured compounds are able to absorb light and are used in the active light-harvesting layer of the solar cell. The very first use of perovskite structures in a solar cell was in 2009, by Miyasaka et al, and the efficiency of the device was only 3.8%. 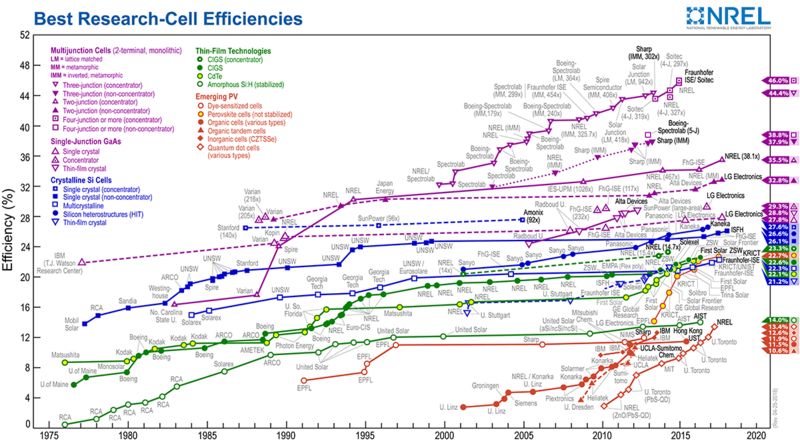 Efficiency levels for solar cells which utilise perovskite materials have been steadily rising since then, and in late 2017 it was up to 22.7%. Because perovskite structured compounds are much less expensive to produce and can be built into solar devices in a relatively easy procedure, there is great incentive to discover ways to optimise the efficiency of this type of device. Now, there are even more exciting developments in this area of research. On 19th April 2018, the latest findings from the post-doctoral Energy Materials and Surface Sciences Unit at the Okinawa Institute of Science and Technology Graduate University were published. They found a way to build a new perovskite material, and its properties make it a groundbreaking step forward for sustainable energy. It is cheap to produce, efficient and stable, and is entirely inorganic. Replacing all organic materials in the cell’s design with inorganic materials is important. Solar cells must be able to withstand heat, as constant exposure to sunlight means the units can heat up fast. Organic materials are typically not thermostable and tend to degrade when exposed to heat, so this improvement made by the researchers helps stabilise the overall construction of the device. Dr Zonghua Liu, an author on the paper and one of the major contributors to the research, reported that “the solar cells are almost unchanged after exposure to light for 300 hours”. The all-inorganic system is built of several layers: glass, FTO (a transparent conductive material), an electron-sensitive layer of titanium oxide, the photoactive perovskite, and finally, carbon. Another great achievement of this new solar cell is the fact that it is able to use all-inorganic materials without the subsequent reduced light absorption (a common disadvantage of using inorganic materials). This was fulfilled by doping the materials with manganese, which has the effect of changing the material’s crystal structure, thus boosting its light-harvesting abilities. “Just like when you add salt to a dish to change its flavour, when we add manganese, it changes the properties of the solar cell,” Liu explains. In addition to this, the research team also upgraded the electrodes that transport the electric current between the solar cell and external wires. This part is usually made of gold, another material that is expensive and complicated to produce. To create gold electrodes, you need very high temperatures and specialist equipment (i.e. a vacuum chamber). This new design of solar cell uses carbon electrodes, which are not only much cheaper to produce but much simpler as well. Carbon electrodes can be printed directly onto the solar cell. There are still some remaining limitations to the solar cells which utilise perovskite structured compounds. These challenges need to be overcome before devices constructed of these materials can be produced on a commercial scale, the main one being the lifespan of the units – perovskite structured solar cells only last one or two years, compared to silicon solar cells which can last 20 years. The research team in Okinawa led by Professor Yabing Qi are continuing their research, focusing on improving the durability and efficiency of the cells, and are working on the process of large-scale manufacture. Pictured below are (left to right) Dr Longbin Qiu and Dr Zonghao Liu holding solar cells made out of their new material. In 2009, perovskite structured compounds were first introduced as part of solar cell technology, but had a very long way to go. In such a short time, the technology has developed at an alarming rate, and these most recent revolutionary advancements promise to pave the way for a positive future. It is more important than ever for us to reduce our dependence on fossil fuels, and perovskite solar cells are looking hopeful.